Shhh…the walls are listening, or rather, the wallpaper is. Soon to be on display at the Fuller Craft Museum just south of Boston, Living Wall by High-Low Tech is an interactive wallpaper that can be programmed to monitor its environment, as well as control lighting and sound. Constructed entirely of paper and paint, the wallpaper can be customized with all manner of sensors, lamps, network interfaces, and interactive embellishments. The result: “Run your hand across this wallpaper to turn on a lamp, play music, or send a message to a friend,” according to the designers. Shhh...the walls are listening, or rather, the wallpaper is. Soon to be on display at the Fuller Craft Museum just south of Boston, Living Wall by High-Low Tech is an interactive wallpaper that can be programmed to monitor its environment, as well as control lighting and sound. Constructed entirely of paper and paint, the wallpaper can be customized with all manner of sensors, lamps, network interfaces, and interactive embellishments. 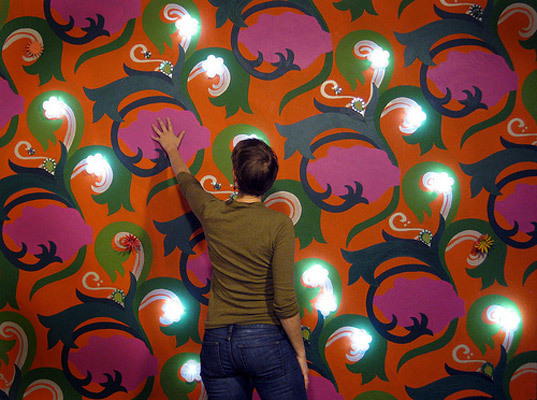 The result: "Run your hand across this wallpaper to turn on a lamp, play music, or send a message to a friend," according to the designers.